Place a unique sentry on your wall using the Ancient Graffiti Copper Steel Barn Owl Wall Art. This striking sculpture brings a fun, avian hint to your setting with ease, and its varied copper tones lend it a natural look. Flat, steel bars create the owl silhouette, with a solid metal plate forming the face. Openings on the plate create the owl's eyes and beak, and the downward peak at the top of the head makes this an easily recognizable barn owl. A flamed copper colored finish throughout the piece lends a slight sheen to your area, and a keyhole opening on the back makes it easy to attach this art to a wall in moments. Its all steel construction makes the item perfect for use in your home or your garden, where it will delight for many seasons. 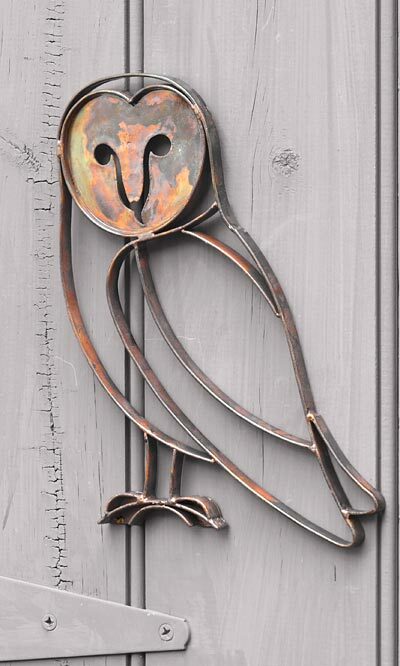 Celebrate owls in your decorating with this Copper Steel Barn Owl Wall Art.